Given a schematic cross-section and some background information about numerical ages, Part 1 of this activity asks students to give the relative time sequence of 14 geological events. 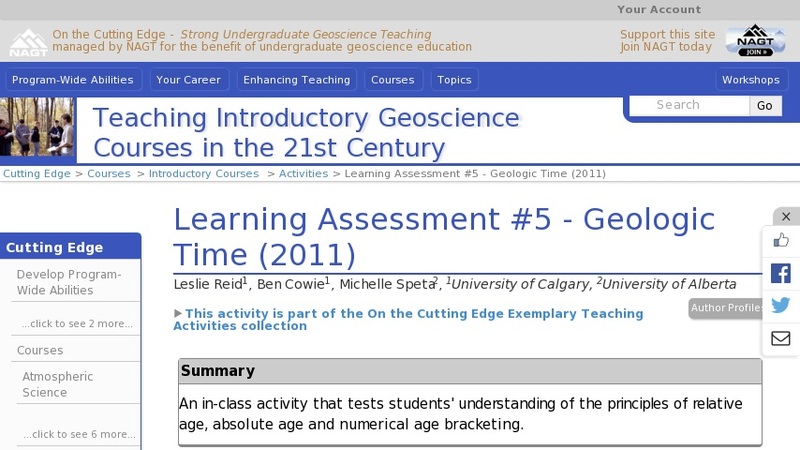 In Part 2, students must provide numerical age brackets for a number of geologic events and/or rock units. In Part 3, students are asked to explain their reasoning for their age bracket assignments in part 2, including the principles of relative age they employed. Students are provided with a copy of the geologic time scale (2009, Geological Society of America) to assist them in completing this activity.